"A Short History of Wimborne Branch, Club and Women's Section of the Royal British Legion"
Book Review by Katherine Seymour, Memorials Officer. 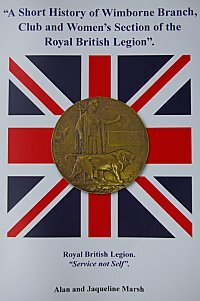 The book describes briefly the origins of the Royal British Legion and its work for the ex-service community before focusing on the formation of the Wimborne Branch. Those interested in the history of the town will find details of the buildings used by the RBL as well as descriptions of Branch activities such as fund-raising events including, of course, the annual Poppy Appeal. Benefactors, officers and members, past and present, have been researched or where possible interviewed by the authors. Their contributions to the Wimborne RBL as well as their military service are described, accompanied in many cases by photos. There are four appendices to the book which will be of particular value to those researching their family connections with the Wimborne district or those studying the part played by the people of the area in wars including the Crimean War, the Boer War, the two World Wars and the Korean War. The authors have included the names from local war memorials, rolls of honour and memorial plaques as well as any other information given, such as date or place of death and rank. In addition, details of the headstones in local cemeteries which mention military service have been included. The book's index allows the reader to find details of an individual easily. Those who deserve to be eternally remembered"
By making available their extensive research, not only into the history of the Wimborne RBL Branch but also into local memorials and cemeteries, the authors can be proud that they have helped to ensure that Remembrance carries on in their part of Dorset. Copies of the book, at £10 each, can be obtained from Alan or Jaqueline at Dorset and South Wilts Branch WFA meetings. Copies are also available by post. Please write to: Alan Marsh, Broadacres, Oakley Straight, Wimborne BH21 1SB enclosing a cheque for £11.32 inc. p&p per copy (payable to AW & JL Marsh). Profits from the sale of the book go to the Royal British Legion.